If you own a Enagic Kagen Water Ionizer please do not buy your replacement cartridge filter from this page. These filters shown above (except the Cleansweep) are manufactured in the United States using a proprietary process with FDA compliant materials. These filters are based on a carbon block design which means that they are more tightly packed than the typical granulated activated carbon GAC filters that is used in the Kangen Water Leveluk brands of water ionizers from Enagic. These filters have much smaller pores to trap more contaminants and sediments so please be aware that you might need a sediment filter if you buy the PREMIUM or the ULTRA filters. Read more about this below. The materials and components used in these filters are certified by NSF International against NSF standard 61. The components used for chlorine, VOC and TOC reduction are based on laboratory testing conducted using test protocol contained in NSF standards 42 and 53 respectively. Notice To Owners of Kangen Water Ionizers from Enagic. If you own a Kangen Water Ionizer made by Enagic and you bought your ionizer before the year 2011, you can place your order from this page. If you bought your Kangen water machine after 2011 then click on HG-N compatible replacement cartridge filters for newer models. Most customers use our filters without the need for a pre-filter. However please note that our filters are carbon block design which means they are more tightly packed with filtration media. The filters produced by Enagic are granulated activated carbon (GAC) with much larger pores which allows more contaminants to get trough the filter. In fact the GAC filters will work forever even though its filtration capacity has been exhausted. Customers might think that "my filter worked great for 2 years" not realizing that they we simply drinking dirty water all along. Our Kangen Water compatible carbon block filters will not allow you to drink dirty water. If your water has sediments (microscopic) the filters will clog up and slow its output. This is more inclined to occur with the PREMIUM and ULTRA Performance cartridge filters. For this reason we suggest that a pre-filter be installed to remove sediments before the water goes to the filter in your machine. Please call us for more information on this. The Cleansweep cartridge filter is GAC filter just like the filters made by Enagic. The Cleansweep filter has been tested to remove or reduce several contaminants typically fount in tap water. 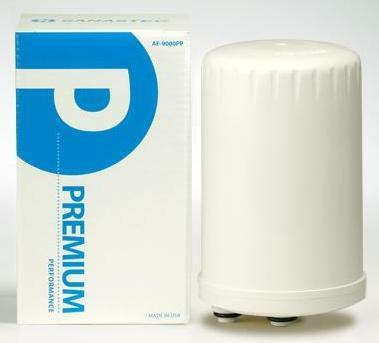 This is definitely a better value than the standard filter sold by Enagic for $90.00. It has a much better quality carbon media. • 98 reduction of lead and mercury heavy metals. In addition to having a much better quality carbon media this filter has KDF and media to remove not only lead but mercury as well. In addition to having a much better quality carbon media this filter has KDF and media to remove not only lead but mercury as well. Enagic does not have a filter in this category which can remove bacteria. Caution: Because this filter is so tightly packed with filtration media, it will clog faster than the others. We suggest using a double housing pre-filter with a 5 micron and our Multi-stage filter on board. This should allow your Ultra filter to last between 4 to six months depending on your water quality. <> Simply use the cleaning cartridge once every 3-6 months to keep your ionizer at optimum performance or more frequently depending on your source water quality. This filter is a special blessing for anyone with an older water ionizer such as the Pure Porte II. It represents an effective way to clean the inside of your water ionizer. Click on Cleaning Cartridge Instructions for details. However sometimes your system might still need to be professionally cleaned. If you think your system needs to be professionally cleaned we have made it simple for you. The cost of covers the cleaning, inspection, testing and return shipping of your unit (except if you live in Hawaii or Alaska). You might want to consult with us to help you make a decision.